Bollywood megastar Akshay Kumar, well known internationally for enabling passionate tailwind for notable social causes, extended his support for the Festival of Education, a first of its kind event in South Asia, conceived by the Government of Rajasthan in partnership with GEMS Education, to celebrate the future of education in India. 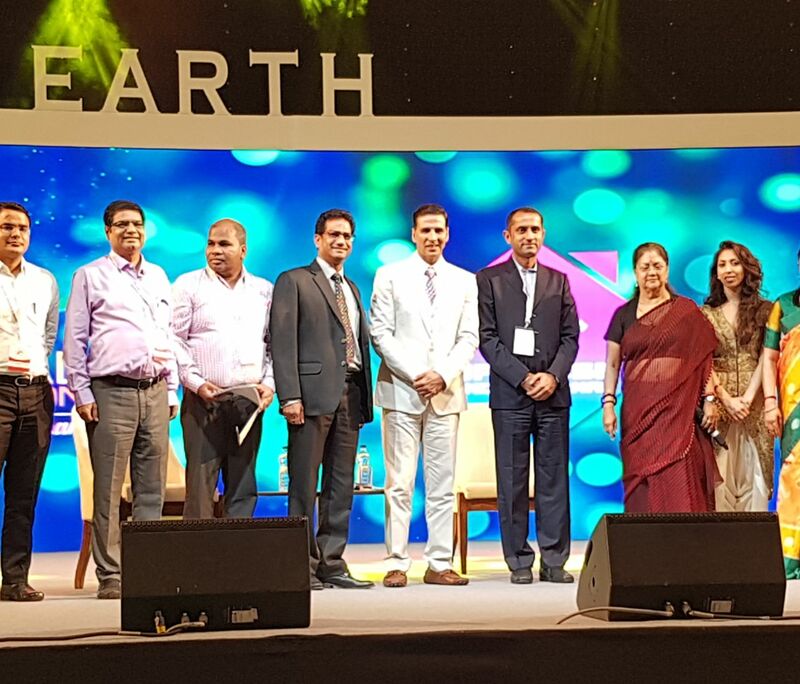 An unprecedented event, the festival saw over 1,00,000 global innovators, academicians, faculty, change-makers, vice chancellors, educationalists, teachers, students, parents, scientists, and policy makers under one roof, united by the same goal – to give shape to the future of education through discourse, discussion and debate. During the panel discussion Akshay Kumar was praised by Right Honourable Chief Minister of Rajasthan, Ms Vasundhara Raje, for his revolutionary efforts to bring awareness to the taboo subjects such as the open-defecation crisis in India. Other Indian respected personalities who participated in the Festival of Education included legendary actress Shabana Azmi,former Miss Universe and actress Sushmita Sen (Main Hoon Na), award winning actress Divya Datta (Special 26, Bhaag Milkha Bhaag), musician Shankar Mahadevan (Founder, Shankar Mahadevan Academy), and fashion designer JJ Valaya (House of Valaya). The worlds of food, nutrition and health will also be represented at the Festival of Education, with the attendance of chef Manish Mehrotra (Indian Accent), Masterchef India 4 Finalist Karishma Sakhrani (Culinary Genius), nutritionist and author Pooja Makhija (Eat Delete) and Himalayan yoga guru Bharat Thakur (Chairman & Founder, Bharat Thakur Artistic Yoga). His Highness Sheikh Nahayan Mabarak Al Nahayan, Minister of Culture and Knowledge Development, UAE was the Chief Guest at Festival of Education. Other high profile attendees included Union HRD Minister Shri Prakash Javadekar, Member of UK’s House of Lords and Deputy Chair of British Council Baroness Usha Prasar, Higher and Technical Education Minister Smt. Kiran Maheshwari, Minister of State for School Education Shri Vasudev Devnani, Members of State Cabinet, MPs, MLAs, Chief Secretary Shri Ashok Jain, Founder of Gems Education Shri Sunny Varkey, Vice Chancellors of several universities, educationists, researchers, students and senior officers of the state government. His Highness Sheikh Nahayan Mabarak Al Nahayan, Minister of Culture and Knowledge Development, UAE was the Chief Guest at Festival of Education. He highlighted that every child should get the right to education, adding that education plays a key role in the personal and social development of any human being as it enables children to acquire knowledge and skills, to help define their future. He called upon parents and the entire society to join the governments to ensure children receive a quality education and to help the overall development of the young next generation. Rt. Honourable Chief Minister of Rajasthan Vasundhara Raje said given the geographical and demographic circumstances of the state of Rajasthan, providing quality education to children in the State was a big challenge. Accepting this challenge, her government brought major changes in the educational set-up and made it learning based. The efforts are helping talented students to obtain opportunities of higher studies in medical, engineering, law, management and other such disciplines. These subjects were basic to the development of humanity, she added. Teachers are important for making of any nation and they should adopt themselves to the upcoming changes. For this, the government was improving their skills and capabilities by providing them training for new teaching methodologies and syllabi. Realizing the fact that degrees alone are not enough for the youth to upsurge in life, the state government had focused efforts on skill training along with basic education. Rajasthan was amongst the top state in India providing skill education to its youth. Also, two new skill focused universities have been established in Rajasthan. She invited the private sector establishments to invest in the development of basic infrastructure in education. Union HRD Minister Shri Prakash Javadekar said countries focusing on research and innovation excel in the world. Prosperity based on natural resources had its own constraints of time and only innovations and adaptations could make it everlasting. Praising the state government’s efforts for making school education useful and relevant in Rajasthan, he said that these ideas were being followed by other states. Improving the quality of education could ensure the development of the country and in the recent past the entire nation had discussed and debated the need to reduce the gap between an academic degree and a certificate of skill. Member of UK’s House of Lords and Deputy Chair of British Council Baroness Usha Prasar commended Rt Hon. Vasundhara Raje for her vision and said that with the steps she undertook, Rajasthan would soon be an education hub. Present and future generations needed skilling along with education and the same was being offered in Rajasthan.